An Unnecessary Siege from Derek Flood on Vimeo. Barcelona- I have a new article this week for Jane’s Terrorism and Insurgency Monitor concerning my observations on the siege of Kobane from October 10-15. I also have a short piece on the subject in the new issue of Jane’s Intelligence Review (subscription required). 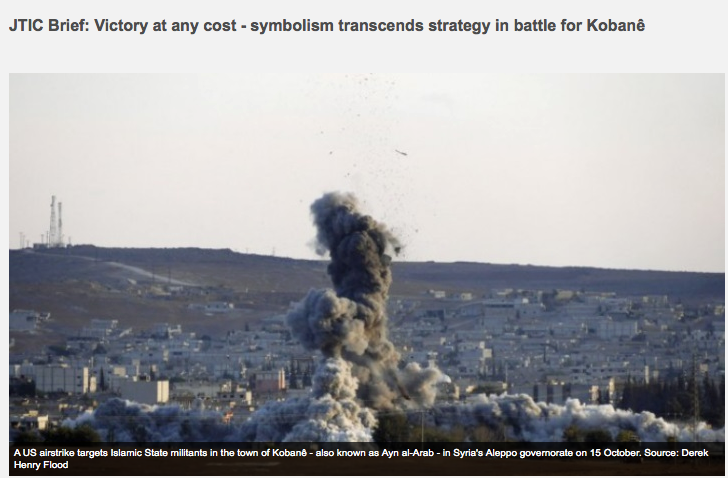 Kobane has lost traction in the media milieu because it has been going on for so long now. The siege is still very much going on with IS reportedly retaking Tel Shahir outside the city. As this AFP video shows, the air coalition is still very much invested in this ongoing battle. Media presence or no, the YPG and now their FSA partners continue to resist the area’s attempted takeover by IS. It was a hectic, grating stint that I departed not because “media lost interest” as I saw a properly funded Washington Post correspondent judgmentally tweeted the other day, but because as a freelancer my financial risk-reward ratio had tipped too far into the risk category and I decided it was no longer feasible for me to stay in terms of cost. When the area was crawling with journos, it was labeled the “hill of shame,” (by someone who works for Rupert Murdoch) and when there were too few of us it is also mocked. Shortly after I left there were the two big developments everyone was waiting for: the American air drop of KRG supplied weapons and aid and the Turks caving (though through a compromise of sorts that keeps the PKK isolated) whereby they will allow the KRG’s peshmerga into Kobane to reinforce the YPG/YPJ while not specifically allowing the PYD to send in its own people. The transfer of pehsmerga through Turkish territory still has not happened and the air drop was examined because some materiel fell into the hands of IS. Click this image to read the full article. 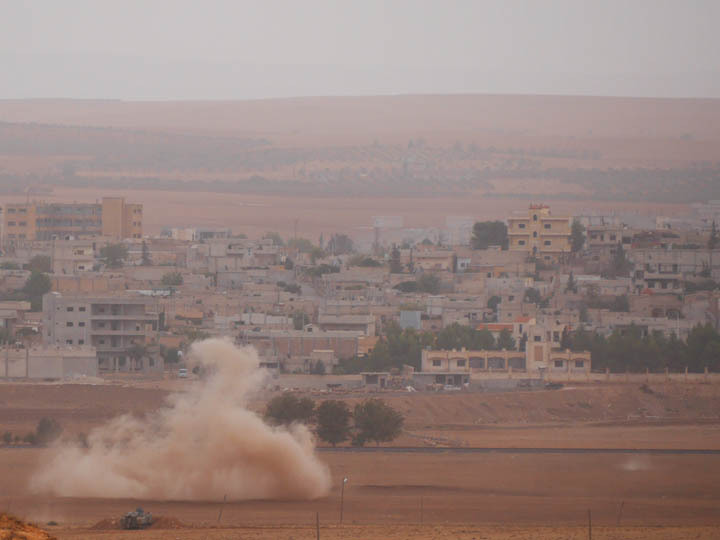 As the Turks have stayed steadily non-confrontational, the global Kurdish community has been politically mobilized over the plight of Kobane and the U.S. and most of the GCC states have intervened with air power in Syria in a broader anti-IS campaign (though Kobane has been almost an entirely American effort in terms of air strikes). 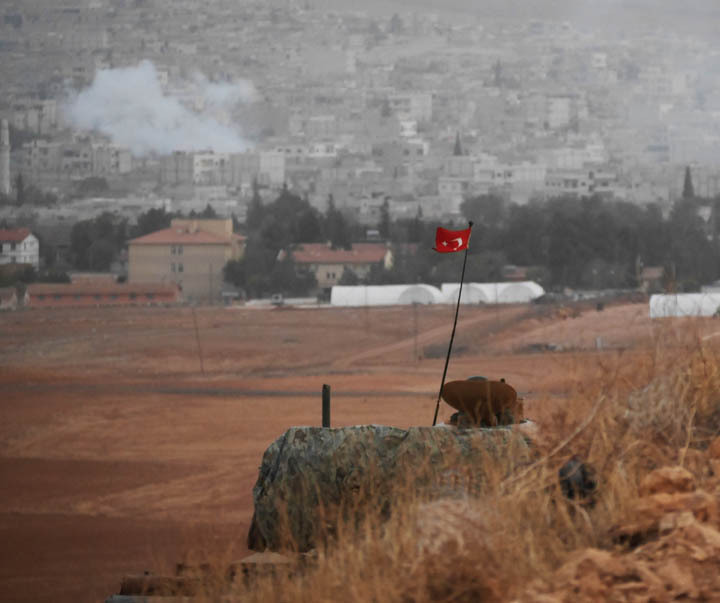 Errant mortars from IS positions land with some frequency on Turkish soil but for now, Ankara wouldn’t dare invoke NATO’s Article 5 protocol regarding an attack on a member state. There has been some chatter that the so-called peshmerga are in fact Iraqi Kurdish-trained Syrian nationals although this was quickly denied by Fuad Hussein, KRG President Massoud Barzani’s chief of staff, who made a press statement that those headed toward Kobane would include solely Iraqi nationals. One recurring thought I had during my nights in dark, lonely Gaziantep which were only made bearable by ultra friendly hotel staff I could make furtive small talk with was how much the Syrian war has changed Turkey itself. Turkey has let itself become extremely vulnerable to the potential of salafi-jihadi mass casualty terror attacks. While Ankara’s focus is still on the threat posed by the PKK and the three decades of on and off asymmetrical warfare with rural insurgency coupled with urban terrorism, the difference between IS and the PKK is that the PKK is an inherently rational actor. If Apoists were not rational, there would be no ongoing peace process to speak of. Some believe that the release of the 46 Turkish and 3 Iraqi hostages capturing during the IS raid on the Mosul consulate indicates that Davutoglu et al believe IS is a pragmatic movement to some degree that Turkey can interact with when necessary. For now Turkey is allowing a policy of containment but Kobane is challenging all that because it is visible for all the world to see. IS jihadis made an astute calculation that be waging a slaughter in a PYD-administered canton of Rojava defended by the YPG, that Turkey would not mind. And in a sense they turned out to be right. In the handful of interactions I had with Turkish security forces, they exasperating seemed more interested in curtailing the free movement of journalists and of course vocal Kurdish activists who had congregated on the border than with confronting IS in the slightest way. Turkish nationalists may say, “this is the Syrians’ war, let them fight it out so long as it doesn’t affect us.’ But that sentiment is entirely unrealistic. The IS poses a grave threat to Turkey itself. It is naive to think otherwise. Walking around the grey warrens of Gaziantep at night scouring for a restaurant that would still be open after a long day on the border, it often crossed my mind that IS supporters, logisticians, and loosely affiliated Syrian and Turkish criminal networks surely abounded. The war inside Syria does not exist in a geographic vacuum. For its rear base are the provinces of southern Turkey. It’s not unthinkable that one could be bundled into a vehicle in some elaborate trap and smuggled into Syria. Erdogan has made a strategic blunder of epic proportions in the last 3 years with his short-sighted Syria policy especially when considering how much Turkey depends on its thriving tourism industry. With Turkey’s budget flights and great bus system, if jihadi networks are active, even if in a relatively quietest fashion right now, in Gaziantep and Sanliurfa, who’s to say they might not be taking some R&R in Marmaris or Fethiye in the future, if not already? You can mentally bifurcate Turkey into two halves let’s say: the western half is for foreign tourists while the eastern provinces bordering Iraq and Syria are where trouble is allowed to happen and where salafi-jihadi volunteers from across the world filter into Idlib, Aleppo and Raqqa governorates. But the reality however is far different. Turkey is really well interconnected. In the heart of Marmaris’ waterfront tourist district you can buy bus tickets to Gaziantep, Sanaliurfa, Hatay and so forth. Turkey’s regions cannot be so neatly separated out. Neither does IS’s virulent ideology respect borders demarcated in the early 20th Century. Just the opposite: it claims it exists to eradicate them.